More than two dozen Pottermen, spouses, guests, and University Alumni Association officials gathered on a rainy day to commemorate the 100th Anniversary of the Death of Edward Potter with a wreath laying ceremony at the new Garden of Remembrance at the downtown campus. At approximately the same time a wreath was also placed on Edward’s grave in the Suresnes American Cemetery, Suresne, France outside Paris. A ceremony was conducted in the Husted Hall amphitheater followed by the wreath laying at the World War I memorial plaque in the Garden. A printed program for the ceremony is posted in the Album, Edward Potter 100th in the Photo Gallery on the Potter Club Alumni Association website. Following the Pledge of Allegiance led by Gary Penfield, `63, Potter Club President, 1963, the group was briefly welcomed by Lee Serravillo, Executive Director of the Alumni Association. He graciously acknowledged the outstanding effort put forth by Loida Vera Cruz, in organizing most of the details for the event. Loida has been an indispensable asset to our functioning. “On behalf of the Edward Eldred Potter Club Alumni Association and the UA Alumni Office I wish to welcome you to this centenary event remembering of the death of 1st Lt. Edward Eldred Potter who died in France on August 1, 1918. Much we know of Edward’s life we owe to his sister, Cordella’s 85 page memoir written in 1935 which in part contains 35 letters and diary entries written by Edward mainly when overseas. Edward was born September 3, 1891 at Windfall in a poor area in NW New York State. He was the youngest of four children of Frederick and Rose Eldred Potter. His parents separated in the late 1890’s. By the early 1900’s three of the children settled with their mother in Plattsburgh. Here, Edward graduated from Plattsburgh Normal School’s Campus High School. “Eddie” as he was listed in the census majored in industrial arts which he taught for a year in Glens Falls, NY. He accepted a scholarship to Union College in the fall of 1914. After spending a semester there he transferred to the newly named New York State College for Teachers (NYSCT) in January 1915 where he joined the class of 1918. On April 6, 1917 the U.S. entered the European conflict then raging in Europe. The following month he applied for the army’s Officer Candidate School. 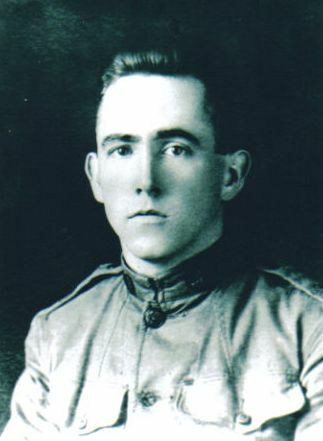 He left Albany on May 13, 1917 for the Madison Barracks located at Sacketts Harbor on Lake Ontario near Watertown. He confided to his sister that he was beginning “a great adventure”. Following the OCS program he opted in August to attend US Signal Corps Preflight Training course then offered at Cornell University. October he received orders to leave for overseas. Finally, with the “hurry up and wait” army he boarded a troop transport bound for France in January, 1918. Assigned to a flight school SW of Paris he began his training. The training was most rigorous. One indicator was that he was in the air 64 times in a two week period. * He enjoyed philosophy and debated with his sister about certain passages from Shakespeare. * He obtained a used bicycle and with others toured the countryside; one excursion rode a round trip of 70 kilometers. * He greatly enjoyed poetry and his memoir includes a number of his favorites . * He was a voracious reader and in a short time during his training he acquired a 45 book collection which when transferred donated them to the Red Cross. He further took the initiative to contact his squadron members taking orders for books available at Brentano’s book store in Paris. His order for 200 books came to $648! * Had a sense of humor in that when his mother knitted him a sweater he noted that it would probably fit someone of 300 lbs. He gave it to the largest man in his barracks. * He was social and outgoing making friends with a number of French families leading to his becoming quite conversant in French. Oh yes! He was partial to red headed girls! Never had a steady, telling his sister there was safety in numbers. On May 13th he completed his flight training along with a commission as 1st Lt. Even so he continued necessary flight exercises to prepare him for combat at “the front”. He mentioned several times that he hoped to fly a Liberty powered plane. 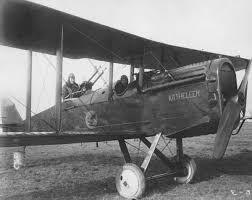 This referred to the DH-4 a fighter bomber built in the U.S. In July he received orders to transfer to another field where shipped planes were assembled. Pilots were needed to ferry the assembled planes to various other bases where they were needed. workmen on the field made a sharp turn causing his plane to crash mortally injuring him; dying on his way to a hospital. He was buried at the Suresnes Military Cemetery outside of Paris. In the absence of a member of the Potter Family, Susan Potter Mintzer sent the following greeting on behalf of the Potter Family to Paul Ward. I am so sorry to take so long to get back to you! honoring my grand uncle Edward. The gathered group went to the area outside Husted and Draper Halls in the Peristyle connecting the two buildings for the wreath laying ceremony. Eugene McLaren, `45 and Jack Higham, `57 moved the wreath to the WWI Memorial plaque area, which concluded the ceremony. The group then adjourned to the Alumni House for lunch. Attendees: Potter Club Alumni members attending posed for a group photo on the stairs at Alumni House. The list of names as it appears in the printed program caption includes late registrants and those who were unable to attend, and those who miised being in the group photo.. In addition to these persons, the following also attended: Geoff Williams, University Archivist Emeritus; Brian Fessler, `06, `07, UAlbany Alumni Association President; Casey Crandall, `07. `12, UAlbany Alumni Association Board; Potter Club Alumni member spouses: Janet Mack Higham, `58, `86; Linda Cross; Sandra Hunt Hawrylchak, `71, and Vincenza Davis. Welcome Remarks: Brian Fessler, `06, `07, Alumni Association President extended greetings from the Alumni Association. Paul Ward has asked me to say a few words about President Brubacher. There is a lot that can be said about Brubacher who was the second longest serving president in the school’s history, his 24 years at the helm are exceeded only by William A. Milne, President, 1889-1914. In my opinion Brubacher was one of the two great leaders of the school during it’s first hundred years. In recognition of his prominence the third dormitory/student union on Alumni Quad, the first funded by NY State, was named in his honor. Unfortunately, in my opinion anyway, during a time of financial weakness in the 90s, Brubacher Hall was leased long term to the College of Saint Rose. St. Rose still uses it today. We could probably use that dorm space today for the greatly expanded role of the Downtown Campus which now includes the old Albany High School. Brubacher oversaw, and more importantly campaigned for, the expansion of the school that has only been exceeded by Evan R. Collins who presided over the expansion of the NYSCT to the State University of New York at Albany. Collins did expand the Downtown Campus but the creation of the Uptown Campus was far more the act of Rockefeller than of Collins. 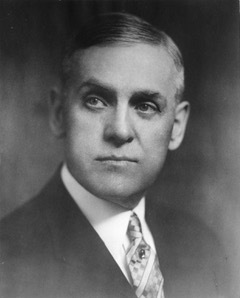 Among Brubacher’s accomplishments were 1) doubling the size of the Downtown Campus from three to six buildings (adding Page, Richardson & Milne Halls in 1929; 2) being an early advocate for dormitories for students (1919) and particularly for women when NYS refused to pay for dormitories, Brubacher supported the Alumni Association in raising funds for to build the first State College Dormitory opened in 1935, and named Pierce Hall in 1941; 3) doubling the size of the faculty and the student body while greatly increasing the qualification of both bodies (for faculty he introduced Sabbatical leaves so they could earn advanced degrees while for student he continually raised the standards for admissions from 70% on the Regents Exams in 1916 to the point where the cutoff point for admissions was regents scores in the mid to high 80% by the end of his tenure and more than doubled course offerings; 4) greatly increasing extension teaching in the Capital District Region and expanding summer sessions (from 250 in 1917 to 1,400 in 1939), and with that came greater graduate student enrollment; 5) winning national recognition for the academic quality of the NYSCT (the school’s graduates were placed on the list of institutions preparing approved students for graduate work in 1921 by the Association of American Universities and in 1931 the school’s female graduates were approved for membership in the American Association of University Women, both singular honors. I think that what you will be more interested in is his solicitude for the student body. Whereas Milne rejected the student request to form a student association in 1914, Brubacher, when faced with a similar request in 1915, gratefully accepted the proposal and turned the matter over to a faculty committee. The result was a formal organization of seniors with superior academic and leadership abilities in 1917, known to many of you as MYSKANIA. They watched over school traditions and guided student organizations. In 1921 they would give up their control of student affairs to the newly created Student Association. Brubacher was trying to encourage student democracy. In 1916 Brubacher approved the formation of the first continuous student newspaper, the State College News (today the Albany Student Press), again to encourage student involvement in their college. was a bit of a closely guarded secret that the male scores for admission were lowered by Brubacher in the 30s because he believed that the more men in the profession the higher salaries would be for both men and women high school teachers. More to the point of your meeting today is Brubacher’s solicitude for the men and women who served their country in WW I. Brubacher himself apparently suffered some problems during WW I being of German extraction. In 1919 he changed his first name from the apparently German sounding Abraham to the more American sounding Abram. When the United States entered the war Brubacher put the college at the disposal of the War Department, barracks were built on empty land beside the college, the college cafeteria was used as a mess hall. Seven oaks were planted on campus after the war in memory of the seven faculty and students who had died serving their country. The point is that Brubacher was not only looking after the expansion and good name of the college, he had a strong tie to the student body and solicitude for their welfare. With that I will turn the meeting over to Paul Ward who will tell you about WW I and the Potter Club. Sharing Remembrances - Paul Ward Paul solicited remembrances from the group after sharing one of his own. A few wre offered which were not recorded. Conclusion/Potter Club Song: Paul Ward thanked everyone for coming to the ceremony and for the help provided by the Alumni Association staff in making the event memorable. The luncheon and the ceremony commemorating the death of 1st Lt. Edward E. Potter concluded with the group rising to sing the Potter Club Song.